Makeover Monday: How many New York Times crosswords have been created by women? The title explains what the chart is displaying. The x-axis and y-axis are easy to understand. Excluding 1993 and 2018 since they are partial years. The chart has the proper height-to-width ratio. The title could be a bit more informative. 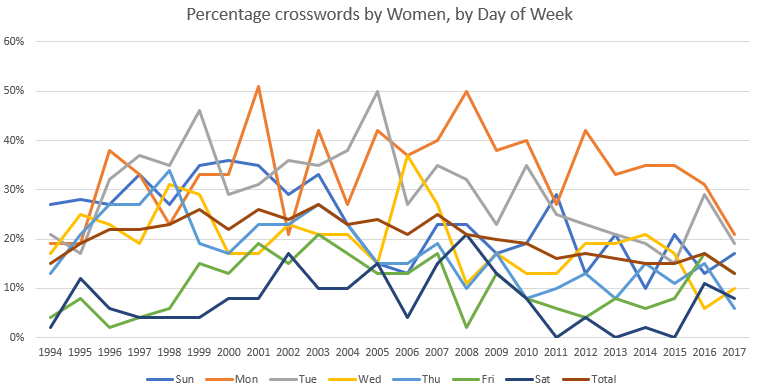 Something like "Over the last 24 years, there have been only three weekdays where women has constructed at least 50% of the crosswords." There are too many colors, making the chart distracting and the lines hard to follow.